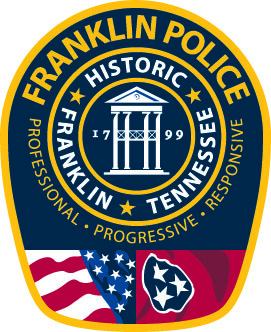 At 2:30pm, Friday, Franklin Police Chief Deborah Faulkner will swear in and personally hand Franklin Police badges to Officers Kyle Brink, Britton Cornell, Craig Kitt, Ashlee Metilor, Matthew Thompson, and Jarvis Robinson. The formal ceremony is being held at Rolling Hills Community Church, 1810 Columbia Avenue. There, the six will be joined by Officers Clinton Buchanan, Jesus Coreno, Robert Dilworth, and Ryan Grande, all hired by the Franklin Police Department with prior police service at other departments. The public is invited to attend this one-hour ceremony as we welcome these 10 officers, joining us in service to Franklin. The six officers Chief Faulkner will be swearing-in are among 80, from across Tennessee, graduating from the Tennessee Law Enforcement Training Academy earlier this same day. There, officers from across the State will accept their certification to serve as Tennessee police officers.